Update on Andrews Sykes (ASY). Summary: I was very satisfied with ASY’s first-half progress. The specialist hire group reported positive performances both within the UK and overseas and could now be on course to deliver its best-ever annual results. A 20%-plus operating margin and substantial net cash remain key bookkeeping features, while management hints of an encouraging second half have kept the share price buoyant. I continue to hold. Click here for all my ASY posts. I’m very pleased that has been the case, with this first-half statement revealing revenue up 17% to £35.3m and operating profit up 28% to £8.2m. While these H1 figures were not a clear record for the hire firm — profit during H1 2008 was £8.8m — the general performance seemed very encouraging. In fact, a repeat of last year’s H2 effort could mean 2017 becomes the group’s most profitable year ever. The mention about expensing start-up costs is interesting. I remarked in my review of ASY’s 2016 annual report (see point 1) that the fledgling operations in Europe were now mostly profitable. Revenue within Europe surged 48% during H1 and I assume the overseas progress — with start-up costs now being covered — helped to underpin the 28% profit leap. Sales from Europe now represent 20% of ASY’s top line. However, I note there was no mention of the effect of the weaker GBP on ASY’s international performance. Meanwhile, revenue from the UK gained a useful 12%. These interim figures confirmed ASY remains a high-margin business. I am impressed 23% of first-half revenue was converted into profit — the best H1 conversion since 2010. Elsewhere in the accounts, net funds ended the six months a few £000k lighter at £17.4m. One item the cash-flow statement revealed was an extra £458k contribution to the group’s defined-benefit pension fund. This type of contribution is not charged to the income statement and, in ASY’s case, is not insignificant when the cost now runs at almost £1m a year. The irony here is that ASY’s balance sheet shows a pension-scheme surplus of £2.6m. I’ve looked at the pension situation in a bit more detail in this Comment below. Almost all of the left-over cash flow was distributed as an 11.9p per share/£5m dividend. These results promised an identical payout during the second half. 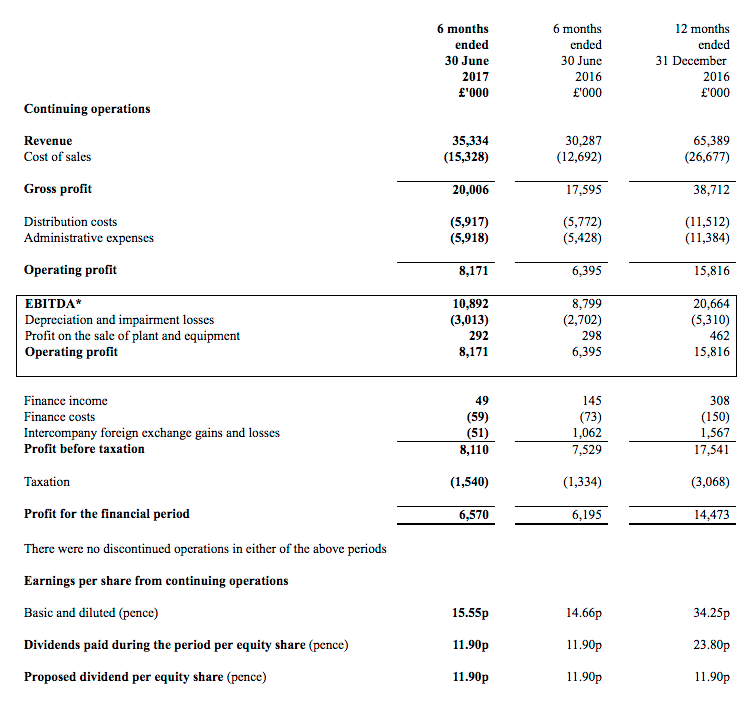 ASY’s operating profit presently runs at £17.6m a year and translates into earnings of £14.3m, or 33.7p per share, using the 19% tax charge applied in these results. Subtract the £17.4m net cash position from the £258m market cap (at 610p) and the enterprise value comes to about £241m or 569p per share. Then divide that 569p by my 33.7p per share earnings guess and I arrive at an underlying P/E of approximately 17. Clearly the stock market believes ASY’s growth can now continue at a decent pace and that the ‘lost’ decade of 2006 to 2015 — when revenue and profit remained broadly stagnant — will gradually fade into a distant memory. With hindsight, the time to have bought more of these shares was exactly twelve months ago, when the signs of improved trading were becoming clear and the underlying P/E was only 11. The price has since climbed 75%. Meanwhile, the trailing yield is 3.9% and my 33.7p per share earnings calculation covers the trailing 23.8p per share payout 1.4 times. This entry was posted in Andrews Sykes, My Shares and tagged Andrews Sykes, ASY on September 28, 2017 by Maynard Paton. A follow-up to point 6 of my review of ASY’s 2016 annual report. At present, the scheme’s assets of £44,403k are required to pay annual member benefits of £1,624k, which is equivalent to a 3.7% required return. That return is quite high relative to other schemes (with major deficits) I’ve looked at. If you adjust for the contributions of £1,080k less scheme admin costs of £134k, the required return is (£1,624k – (£1,080k – £134k))/£44,403k) = 1.5%. That is a much more comfortable required return and in line with other pension schemes. So it seems the extra contributions are required to ensure the benefits can be paid if the value of the assets are hit in any downturn, which would leave the required rate of return from the assets to pay the yearly benefits far more demanding. These days I tend to ignore the started pension liability calculation and just compare the assets in the plan with the benefits that need to be paid and the contributions being made. Essentially, can the scheme’s assets pay the benefits with a very modest yearly return?